Please join us for the Pacific Northwest Debut Appearance of Kahn, who is without a doubt one of the most crucial and commended producer/dj’s to emerge in the past few years. Kahn very much embodies the Bubblin ethos of embracing a wide range of dance sounds in both his productions and his dj sets, with distinctive and compelling takes on garage, grime, and dub wise styles – we can hardly wait for his set, trust it’s going to be amazing. This will also be Lincolnup’s birthday party – come hug it out with your guy! Plus we’re stoked to be throwing our first event at Tonic Lounge, who have graciously re-opened their fine venue to dance music sounds. They’ve even taken Lincoln on to do their dance music programming and talent buying – at last providing a solid, and very much needed, additional venue for dance parties on the Eastside. We’re programming two rooms of dope sounds for the occasion, featuring a bunch of our favorite local ringers in addition to Kahn – a whole lotta vibery awaits! 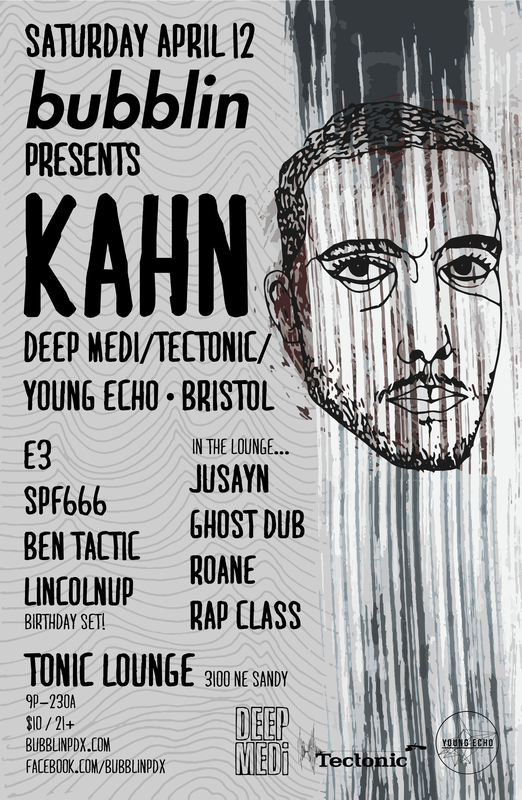 Hailing from Bristol (U.K) and having grown up immersed in the city’s renowned culture of sound systems, punk rock and hip hop; Kahn is at the forefront of the new wave of Bristol producers and DJs. From his first vinyl releases in 2011 on cult record label Punch Drunk Records to his more recent cuts on Mala’s Deep Medi label, Kahn has established himself as one of the most diverse producers of his generation. His production style tends to draw influence from dub reggae, early 2000’s grime, digital dancehall, UK steppers and music from across the 140bpm spectrum. As part of the Young Echo collective, Kahn has also explored other areas of electronic music and incorporates his own vocals and instrumentation into his sound. As a DJ, Kahn keeps true to the traditions of sound system culture with sets full of dubplates and versions. Whether performing solo as Kahn, alongside fellow grime producer and DJ Neek or as Gorgon Sound (dub and dancehall project also with Neek), it’s always a dubplate and vinyl operation. As well as releases and affiliations with a number of respected record labels, Kahn also runs his own imprint with Neek, Bandulu Records. Since forming at the beginning of 2012, the record label has gone on to showcase the darker forms of instrumental Grime permeating from Bristol’s current underground scene, with limited runs of heavyweight vinyl and hand screen-printed artwork. This entry was posted on March 25, 2014 at 9:43 am and is filed under Bubblin. You can follow any responses to this entry through the RSS 2.0 feed. You can leave a response, or trackback from your own site.